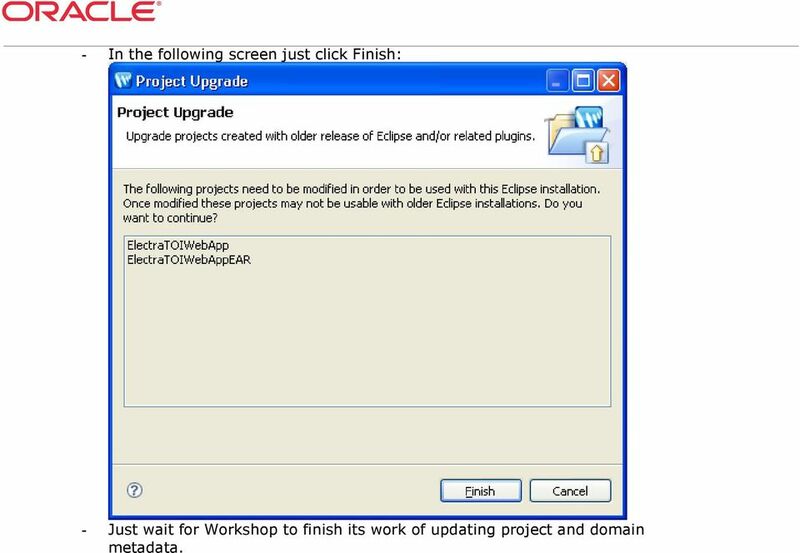 Download "Workshop for WebLogic introduces new tools in support of Java EE 5.0 standards. 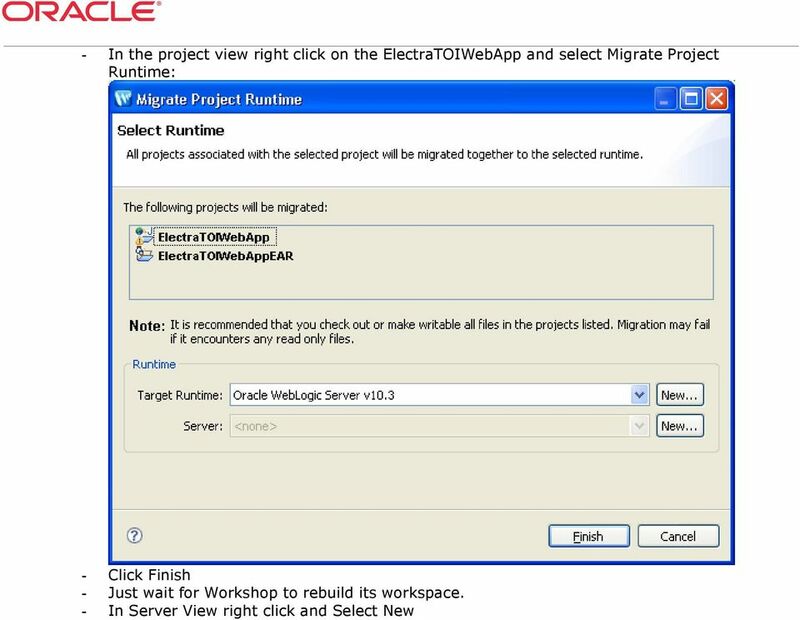 The support for Java EE5 includes the following technologies:"
1 Oracle Workshop for WebLogic 10g R3 Hands on Labs Workshop for WebLogic extends Eclipse and Web Tools Platform for development of Web Services, Java, JavaEE, Object Relational Mapping, Spring, Beehive, and Web Applications. 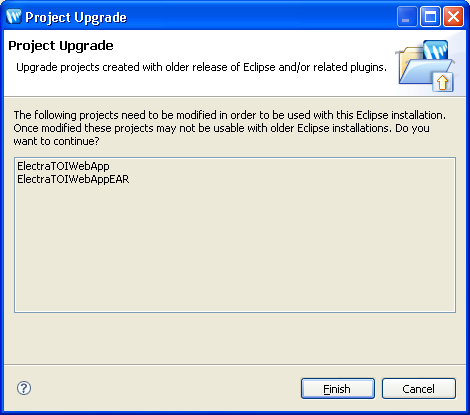 It installs as a plug-in to your existing Eclipse, or will install Eclipse for you. 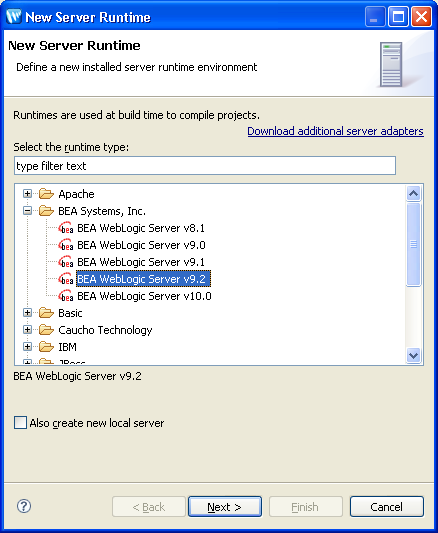 Workshop for WebLogic is used to develop, build, assemble, deploy, debug and test Java SE, Java EE, Web Services, Java Web Applications, Object Relational Mapping on Eclipse. 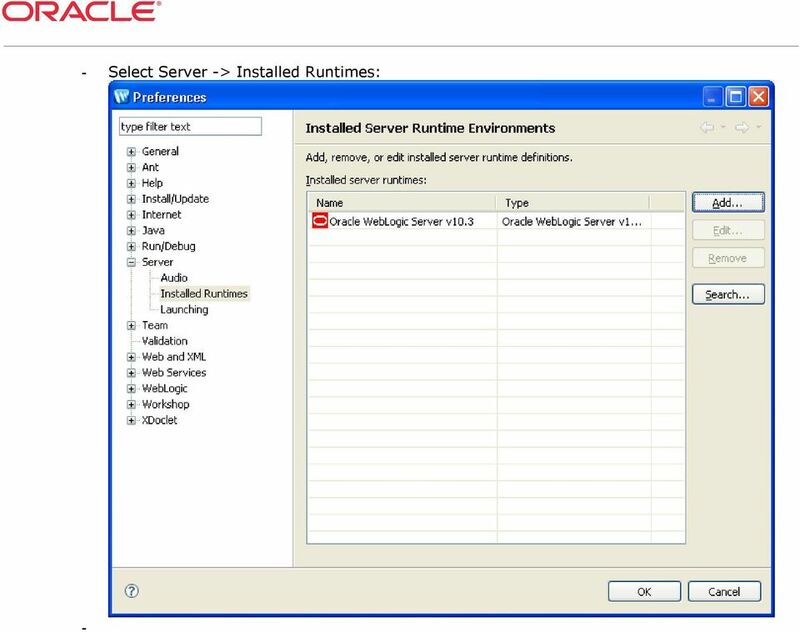 If you are an Oracle WebLogic Server user, this is the free tool for you. 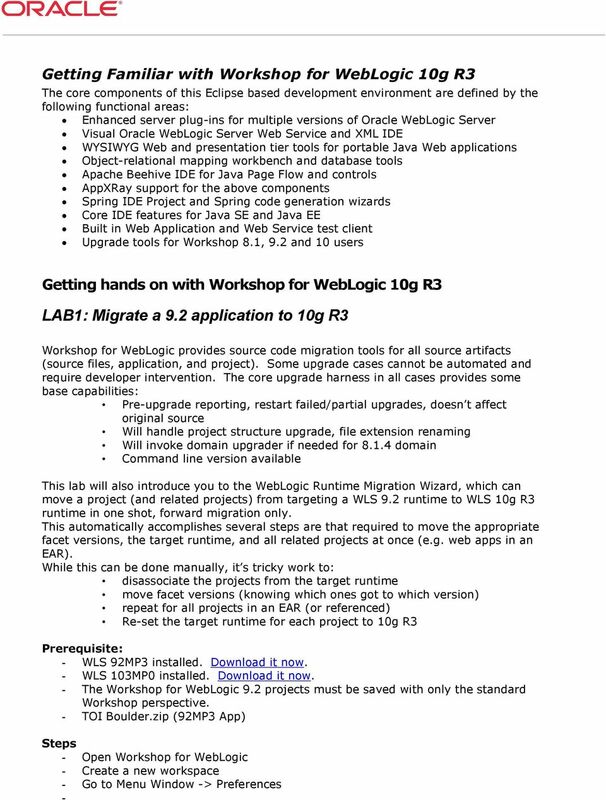 10g R3 Release Notes Workshop for WebLogic introduces new tools in support of Java EE 5.0 standards. 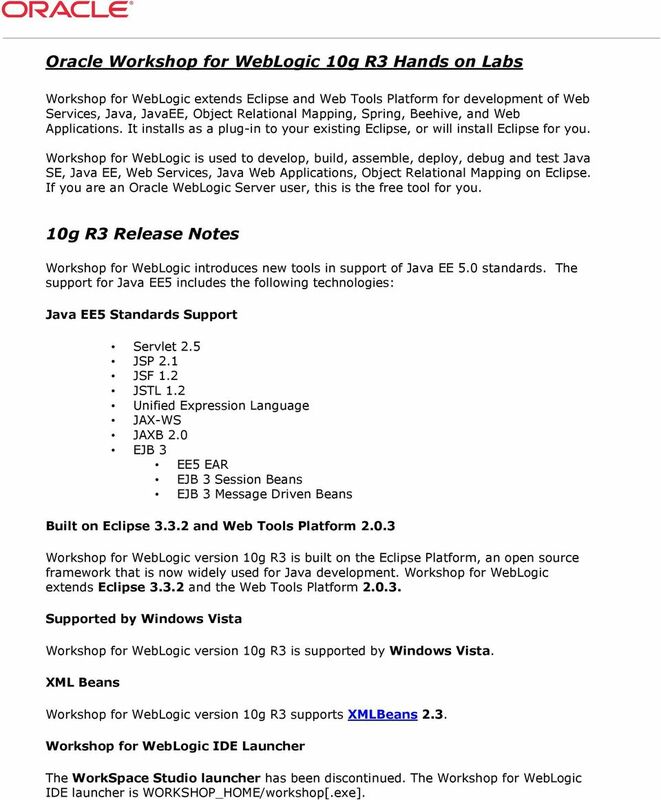 The support for Java EE5 includes the following technologies: Java EE5 Standards Support Servlet 2.5 JSP 2.1 JSF 1.2 JSTL 1.2 Unified Expression Language JAX-WS JAXB 2.0 EJB 3 EE5 EAR EJB 3 Session Beans EJB 3 Message Driven Beans Built on Eclipse and Web Tools Platform Workshop for WebLogic version 10g R3 is built on the Eclipse Platform, an open source framework that is now widely used for Java development. 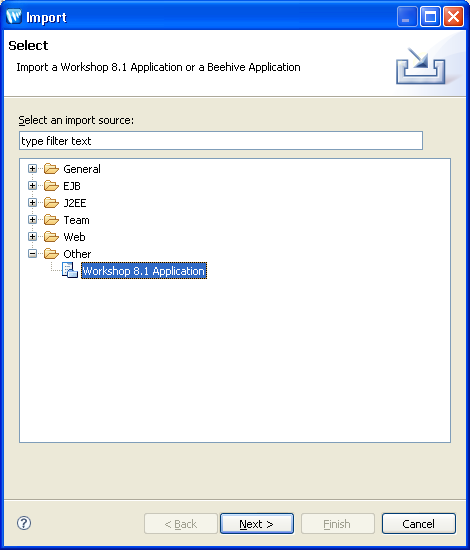 Workshop for WebLogic extends Eclipse and the Web Tools Platform Supported by Windows Vista Workshop for WebLogic version 10g R3 is supported by Windows Vista. 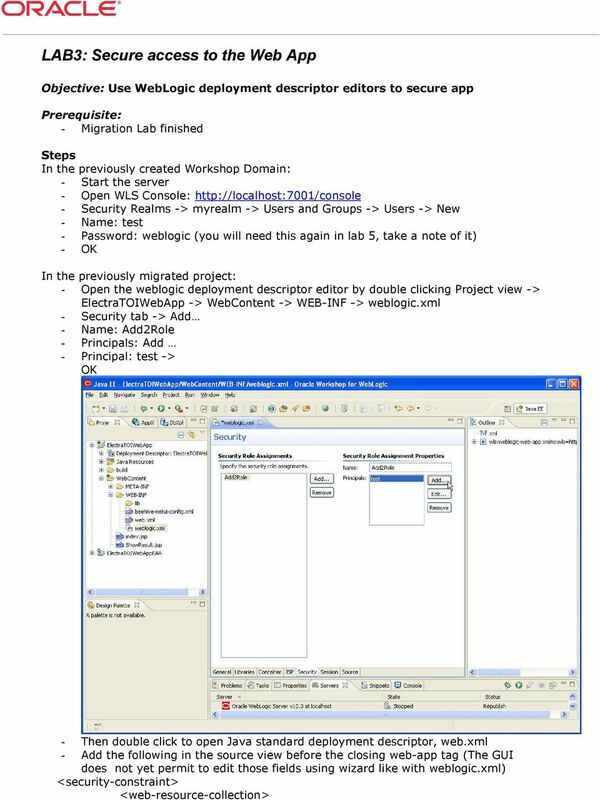 XML Beans Workshop for WebLogic version 10g R3 supports XMLBeans 2.3. 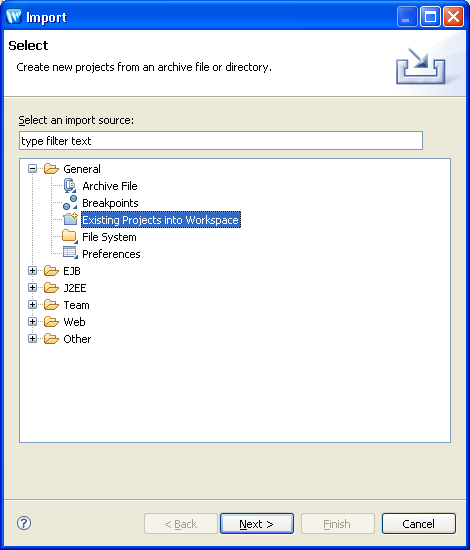 Workshop for WebLogic IDE Launcher The WorkSpace Studio launcher has been discontinued. 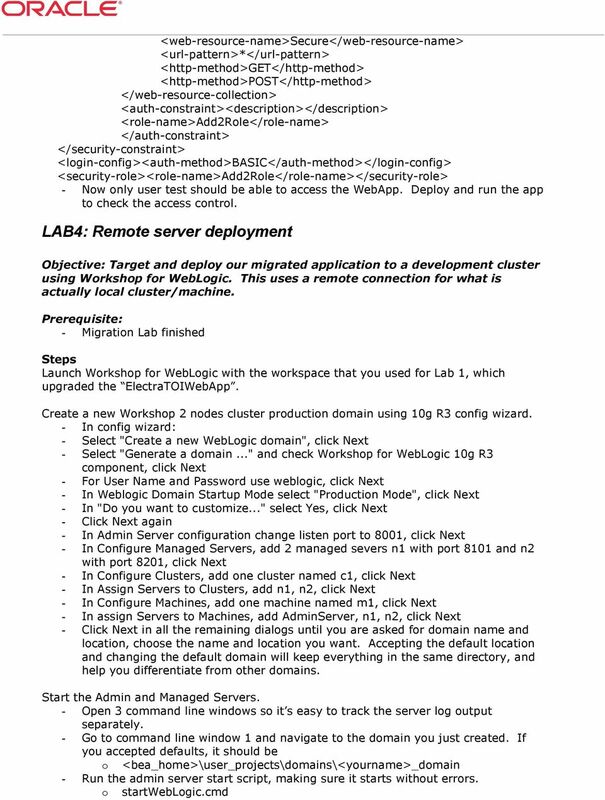 The Workshop for WebLogic IDE launcher is WORKSHOP_HOME/workshop[.exe]. 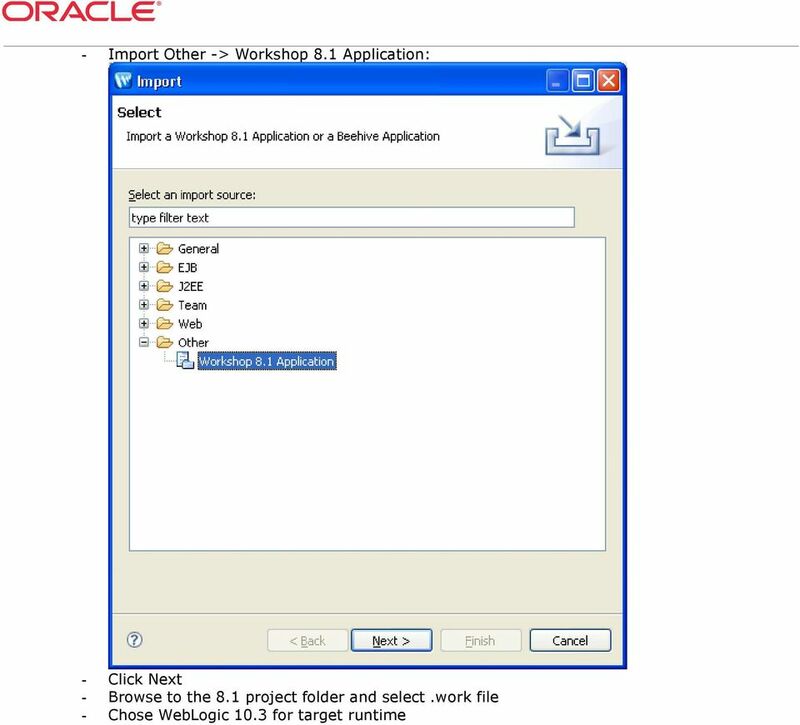 6 - In the following screen just click Finish: - Just wait for Workshop to finish its work of updating project and domain metadata. 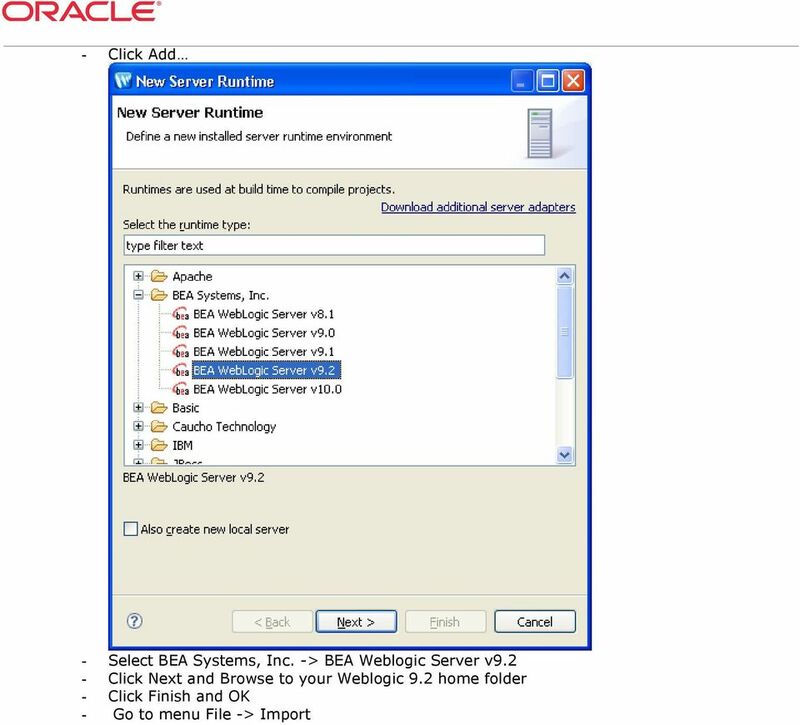 Configuration Guide Configuring BEA WebLogic Server for Web Authentication with SAS 9.2 Web Applications This document describes how to configure Web authentication with BEA WebLogic for the SAS Web applications. Don t get it right, just get it written. 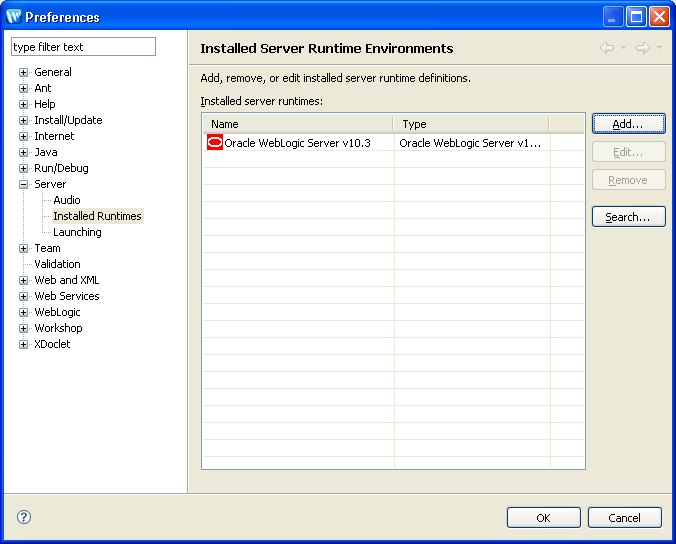 WA1625 Web Services Development Using WebLogic Server v10. Classroom Setup Guide. Web Age Solutions Inc. Copyright 2012 Web Age Solutions Inc. 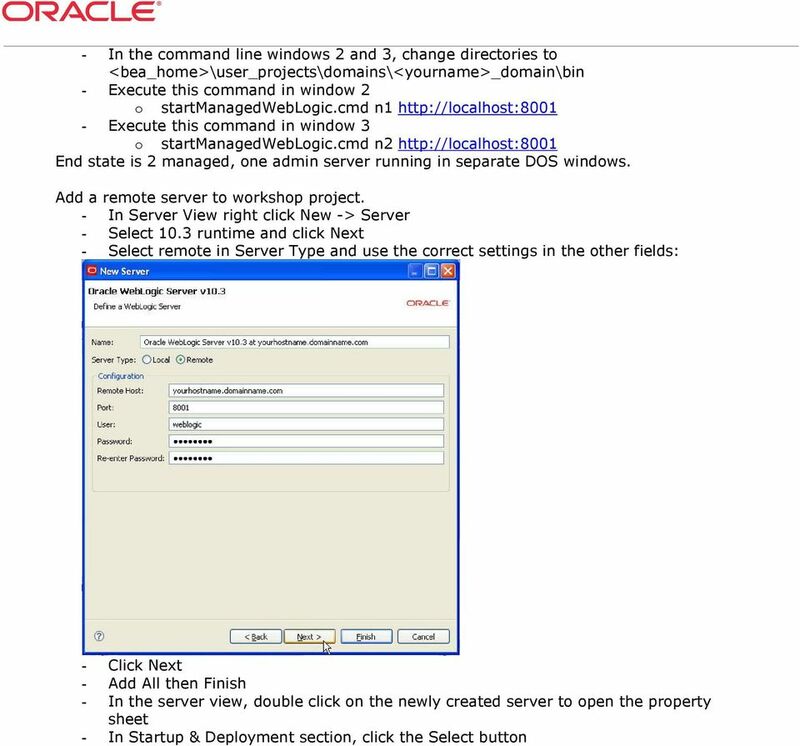 This document summarizes the steps of deploying ActiveVOS on oracle Weblogic Platform. 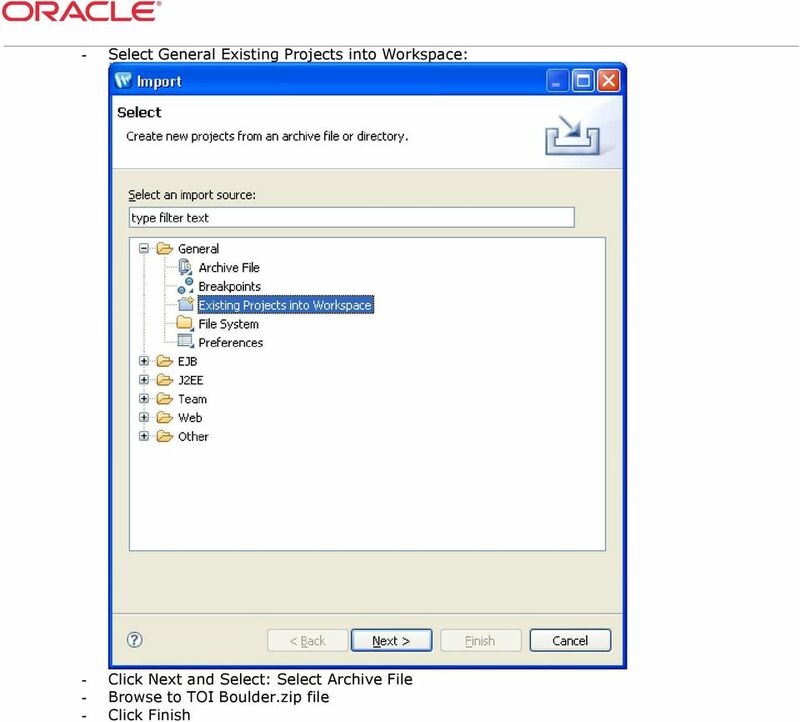 OBIEE Cloning. 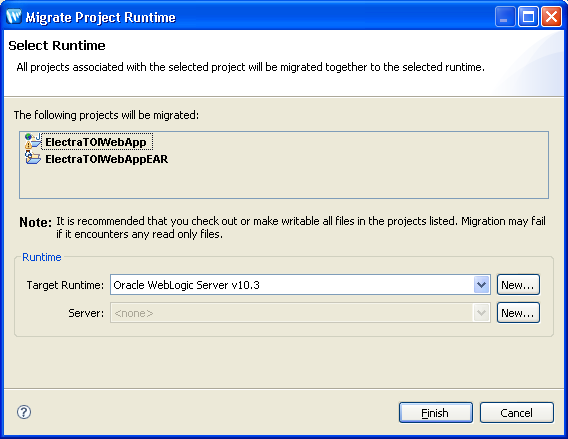 Cloning the OBIEE 11g database migration to a new host. Ashok Thiyagarajan ADVANS MARLBOROUGH, MA AND CHENNAI, INDIA WWW.ADVANSIT. To install Multifront you need to have familiarity with Internet Information Services (IIS), Microsoft.NET Framework and SQL Server 2008. 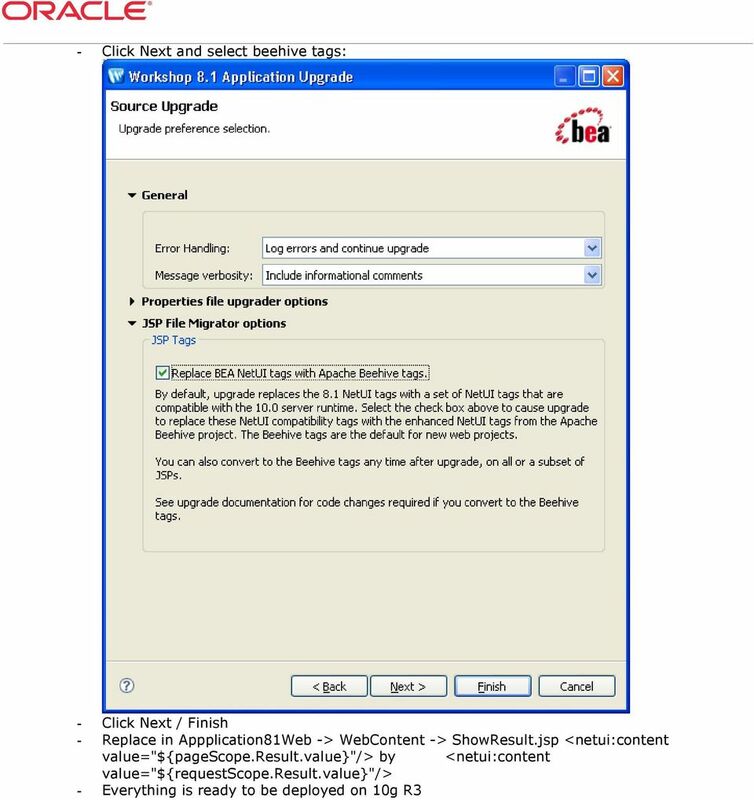 JBoss Server Manager Reference Guide Version: 3.3.0.M5 1. 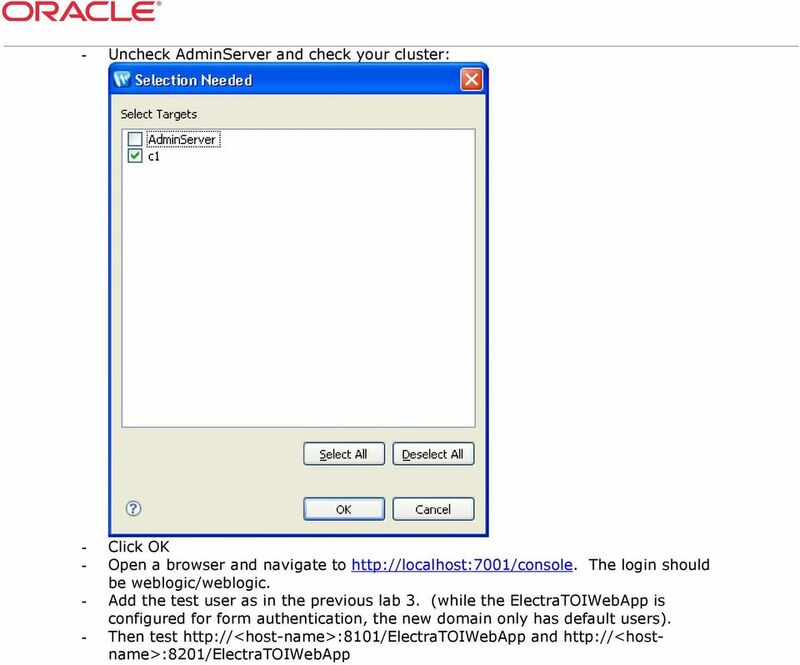 Quick Start with JBoss Server... 1 1.1. 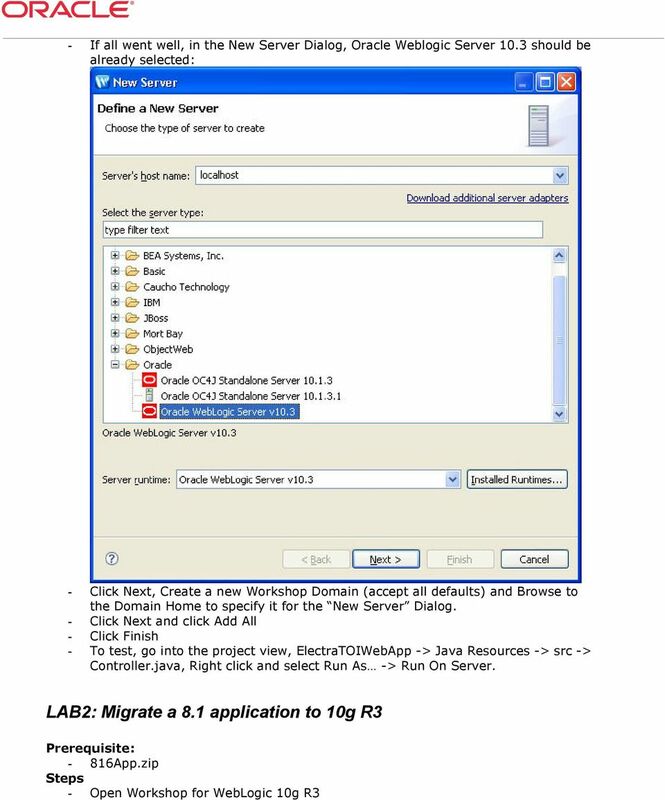 Key Features of JBoss Server... 1 1.2. 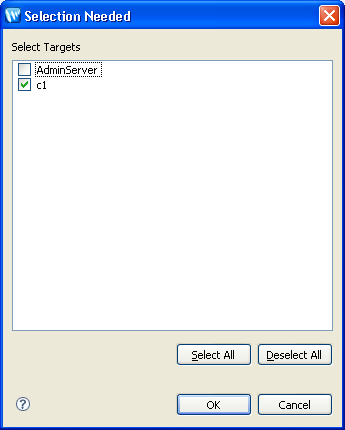 Starting JBoss Server... 1 1.3. 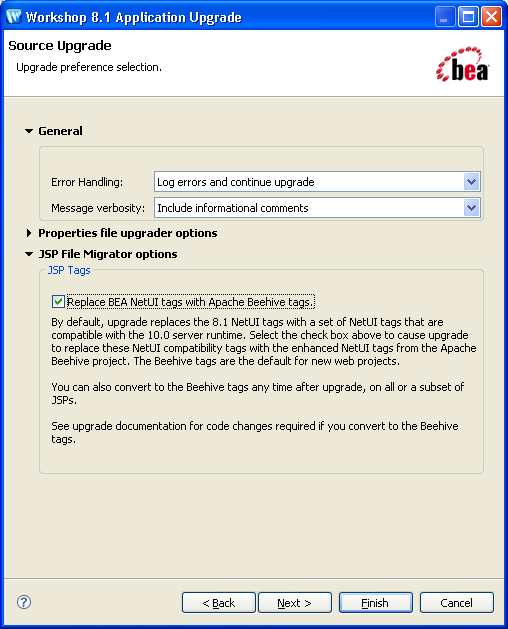 Stopping JBoss Server... 2 1.4. How To Install SQL Server 2014 Express Edition Updated: 2/4/2016 2016 Shelby Systems, Inc. All Rights Reserved Other brand and product names are trademarks or registered trademarks of the respective holders.